Which country is pysanky associated with? Do you enjoy making Easter eggs? It can be a fun family project to die eggs and then hide them around the yard for an Easter egg hunt. The simple colors and designs of basic Easter eggs, though, can't compare to the works of art that some people make! Pysanky refers to the art of making Ukrainian Easter eggs. Pysanky is the plural form. A single Ukrainian Easter egg is a pysanka. The word “pysanky" comes from the verb pysaty, which means “to write." This is quite appropriate, since the designs on these beautiful eggs are not painted on. Instead, they're created with a unique written-wax method called batik. But a pysanka is more than just any egg decorated using a written-wax method. 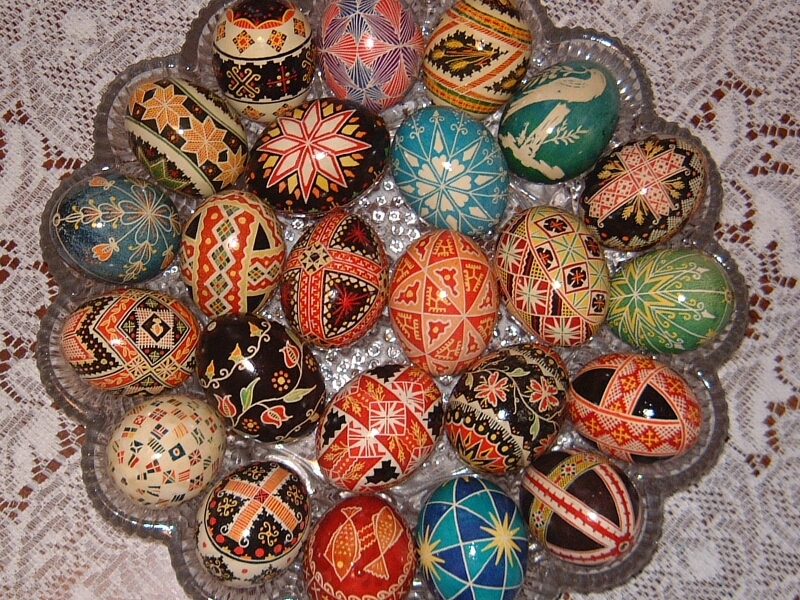 Pysanky are eggs made in this way with specific, traditional Ukrainian folk designs. Experts believe the art of pysanky started back in ancient times in Ukraine. Most early designs featured symbols related to the Ukrainian sun god. Over time, Christianity made its way to Ukraine, and gradually pysanky began to become associated with the Christian celebration of Easter. The written-wax method of decorating pysanky involves using a pin or stylus to write designs onto an egg with wax. Eggs are then dyed a chosen color. Additional designs are written in wax and the steps are repeated with different colors of dye. The wax seals the egg, so that the designs written in wax stay over the course of later applications of dye. When finished, the egg is heated and all the wax is wiped away, revealing a multilayer series of designs in different colors. Ukrainian people still hold superstitious and magical beliefs about pysanky. Some believe they protect homes from evil spirits and disasters. Beliefs vary by region with Ukraine, but it's clear that these beautiful works of art hold a special place in people's hearts. Ready to try pysanky? You'll need plenty of help from an adult, so make this a family project. First, check out some examples of pysanky in this online pysanky photo gallery. There are many beautiful examples to see. Which ones inspire you the most? For an overview of the pysanky process, read through How To Make Ukrainian Easter Eggs. This site will give you a good idea of the steps involved in pysanky. Then check out the special pysanky supplies you'll need. Once you're ready to give pysanky a try, you can follow more detailed pysanky instructions here. You might also want to watch the pysanky videos on this site for additional help. When you're finished, be sure to share your creations with your Wonder Friends. Post pictures on Facebook and let us know how much fun you had making them. We can't wait to see your eggs-cellent works of art! Did you paint Easter eggs this year, Caitlin? How do you like to decorate Easter eggs? I like how you can make all different designs and colors. Every year I dye an egg on Easter. I wonder why is it called batik? Great question, Danielle and Dylan! According to the Online Etymology Dictionary, the word "batik" comes from the Malay word mbatik, which is from the Malay words amba (to write) and titik (dot, point). Thanks for WONDERing with us! This is a great article for Easter. yeah, it could be art, if it has designs on it. Otherwise, if you just slap on blue onto the Easter egg, it's technically not art. Well, art is always in the eye of the beholder, we suppose. Thanks for sharing! I never knew any of this. It all was very helpful for my school project thank you! I am from the Ukraine and I knew that. Hi, Wonderopolis. Thank for helping me learn about pysanky which is "to write" and Ukranie is a country in Euroupe. I never knew that they could be a wax seal on an Easter egg. There are so many beautiful designs, don't you agree? I have a Question...how easy is pysanky? Thanks for all of your help. P.S. the video really helped me learn a lot. I read a book about them. I love to dye Easter eggs the traditional way by dipping them in colored dye, but the designs in the clip were way more detailed. The eggs are beautiful! Our class would love to try that out some time! I thought today's wonder and video were very neat. I think that the next wonderopolis wonder will be about pirates. Also, I just wanted to say I am a very big fan of this website. I think tomorrow's will be about if pirates are real. Yes, I think that Easter eggs are art. Yes it can, because on Easter Eve, you paint eggs and you make it your own. I'm also wondering if your face could be art and I'm asking only you this question. lol. Easter eggs are awesome! I didn't know that you can do so many different designs. They're so cool. Can't wait 'till tomorrow's. Dear Wonderopolis, I loved today's wonder! Sorry that I didn't leave a comment for a while. I was too busy in the past week. I had to go to school and do other important things during the last weekends. Remember back on wonder of the day #539 - Why do dogs chase their tails? I thought wonder of the day #540 was that why does time go by fast and I was wrong. Wonder of the day #540 was not that why does time go by fast. Wonder of the day #540 was How do you get the lead out? I know you can write on eggs.